Globally, the varroa mite, Varroa destructor, is the most serious threat to the western honeybee, Apis mellifera. Varroa is a parasite that feeds on the bee and acts as a vector for viruses. Untreated, colonies will die in just a few years. Varroa is thought to be at the core of unexplained bee losses (Colony Collapse Disorder) across the world. Apiguard and Apistan are proven treatments for varroa control. They can be used with Bee Gym, a device that helps bees groom themselves of varroa mites, as part of Integrated Pest Management. VitaFeed Gold boosts honeybee immune systems. Download Vita’s free Varroa Infographic from the Vita Gallery. The presence of varroa is easily overlooked by beekeepers because its red-brown colour and small size (1.5mm by 1mm) make it so difficult to see on the adult bee. Oval in shape, it is able to conceal itself in places on the adult bee where the bee finds it difficult to groom. Infested hives may seem strong and even give high honey yields – heavily infested bee colonies can bring in a good honey crop and yet be dead within weeks. Examine hive floor debris for mites – purpose-made varroa floors with screens help. In heavy infestations, mites can be seen on adult bees, on wax combs and in cells. As varroa is more attracted to drone brood than workers uncapping and examining samples of drone brood may be used as a diagnostic tool for varroa infestation. A sudden crash in adult bee numbers may be an indication of varroa. Bees with twisted or shrivelled wings, small abdomens or other deformities may be the result of varroa plus viral infections. Poor general colony health and irregular brood pattern may be attributed to varroa plus attack by other disease organisms (viruses, bacteria, fungi) sometimes referred to as Parasitic Mite Syndrome or PMS. Diagnostic treatment of the honeybee colony may be performed with approved acaricides and methods. The original host of the varroa mite was the Asian honeybee, Apis cerana, but it can tolerate varroa mite infestations because the reproductive rate of the mite is not too high (it could only reproduce in drone brood) and because the adult A cerana bees remove mites by grooming and cleaning behaviours. In the European honeybee, Apis mellifera, however, the varroa mite can infest both drone and worker brood and A. mellifera shows little little grooming or hygienic behaviour to get rid of the mites. Varroa jumped hosts to A. mellifera probably sometime in the early 1900s and has spread rapidly to almost all the world’s beekeeping areas. Shortly before the brood cells are to be capped, the varroa mites detach themselves from the adult bees and enter the cells and hide in the brood food provided by nurse bees. Once the cells are capped the young larvae ingests the brood food, liberating the mite or mites. The varroa mites then pierce the cuticle of the bee larvae and feed off the haemolymph. Only after the first blood meal can the female mite lay her eggs, which quickly hatch and infest the cell with mites. A single brood cell can contain as many as ten mites of different generations. These sucking parasites weaken the bee brood, impairing normal development. When varroa infestation is severe, worker bees and drones emerge with shortened abdomens, misshapen wings or other deformities. Young bees such as these have a brief life expectancy and are generally immediately rejected by the colony. Attached to flying bees: Varroa mites attach themselves to the abdomen or thorax of adult bees. Spines on their legs also entwine with hairs on the body surface of the bee. Varroa mites can achieve wide geographic distribution by securing themselves underneath or between the sclerites of the bee and being carried in flight. Carried by a robber bee: A robber bee that has been infested with varroa mites can transfer them to previously uninfested hives during robbing. A robbing bee may also become the unsuspecting host when stealing stores from an infested hive. Drifting Bees: Varroa mites can also be transmitted during swarming or by drifting bees. Drones, in particular, can carry mites from one hive to another, sometimes over large distances. where a colony social structure has already been weakened by varroa, hives are more vulnerable to robber bees, which pick up and then disperse the mites to their own and other colonies. 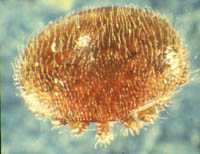 In recent years, some varroa mites have become resistant to pyrethroid treatments such as Apistan, but not to Apiguard. The development of resistance is an almost-inevitable biological phenomenon, but its progress has been hastened by poor beekeeping practices. Using Integrated Pest Management and with strict adherence to instructions on approved treatments, the risks of encouraging resistant varroa will be minimised. 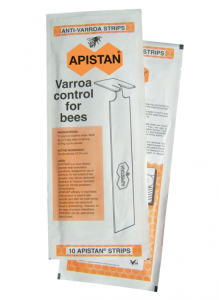 Vita’s varroa mite control products are Apistan and Apiguard. Despite the existence of varroa resistant to pyrethroids, Apistan is still effective in many areas. A simple test will show if you have pyrethroid-resistant varroa. If many mites fall during a 24hr hive treatment with Apistan, resistance, if present will be low level, allowing good control with Apistan over a 6 week treatment period. Varroa varroa are resistant to Apiguard are unknown. 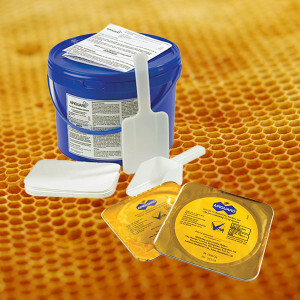 VitaFeed Gold can help maintain healthy colonies more likely to withstand varroa infestations. Vita’s research and development continues to investigate new varroa control treatments. Currently Vita is focusing on two new acaricides, one of which is a near-natural product. The stress and physical damage caused by varroa can be devastating, but their associated viral and bacterial infections are often the real cause of colony demise. Varroa acts as a vector for viruses while stress, such as poor foraging weather, lack of food, water and space, increases the vulnerability of bees to viruses and bacterial infections. While there are currently no treatments known for viral disorders in honeybees it is possible to limit the effects of these diseases by controlling the mite populations and the contributory stress factors. 1. Monitoring the infestation level of the colony. This will indicate whether the mite population is building up to levels that will harm the colony. It will also indicate if the current method of control is not proving effective. 2. Use a combination of methods. The most effective control of varroa can be gained by using a combination of both biomechanical methods and chemical methods. These work in different ways and can be practised at different times of the year. 3. Use approved varroacides such as Apistan or Apiguard. These are proven to work and to be safe for bee and the user. It is also important to follow manufacturers’ instructions. Incorrect use may result in residues in the hive products and it may promote the development of mite resistance. 4. Use essential oil or organic acid treatments with great care. If legal to do so, in rotation with registered acaricide products in a concerted Integrated Pest Management strategy. Drone trapping and restricting queen movement can be a useful diagnostic and secondary control measure. 6. Use a co-ordinated approach. Developing a treatment programme with other beekeepers in the area will help reduce the likelihood of re-infestation.